I made this photo a few days ago while on an evening walk. The light was just softening and I found the dead stems an interesting subject, considering the world around is greening up with the first few truly mild days. 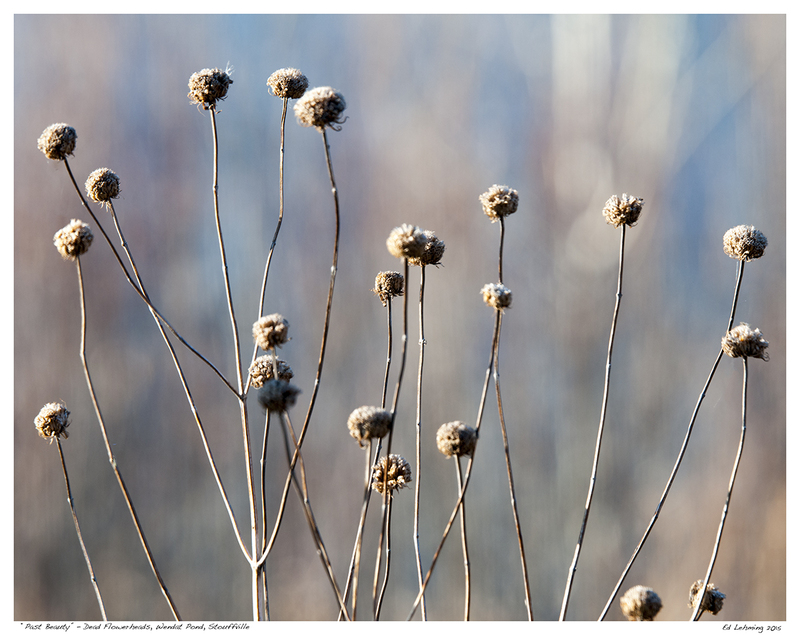 These are old flower heads from wildflowers growing around Wendat Pond. The pond was named after a large native city that was found to have been located in this area. For me, it’s a nice place to walk and consider what it may have looked like a few centuries ago. Did those early people look at things the way I do? To make this photo, I took advantage of the soft light and a depth of field just narrow enough to keep the stems in focus while trying to isolate the flower heads from the background. 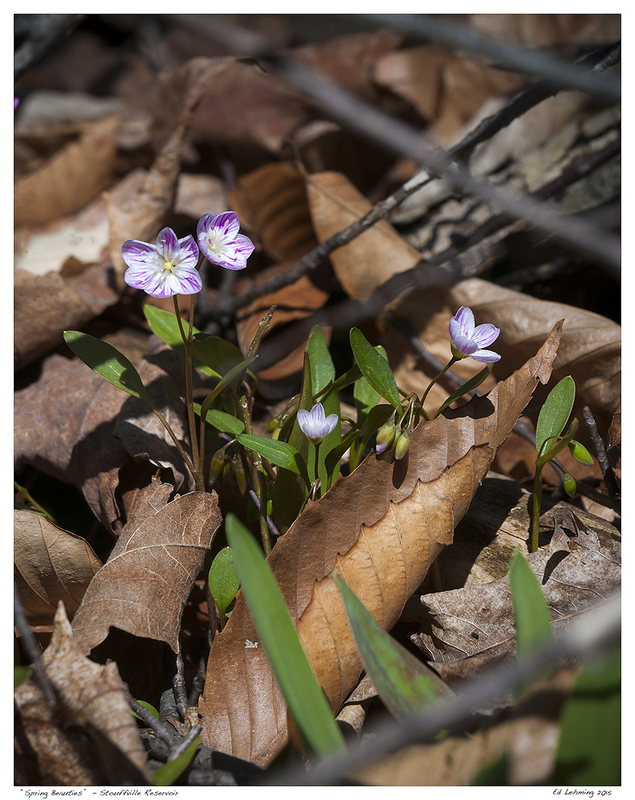 This entry was posted in Photography and tagged dead, depth of field, dry, flowers, native, Pond, spring, walk, Wendat on April 30, 2015 by Ed Lehming Photography. 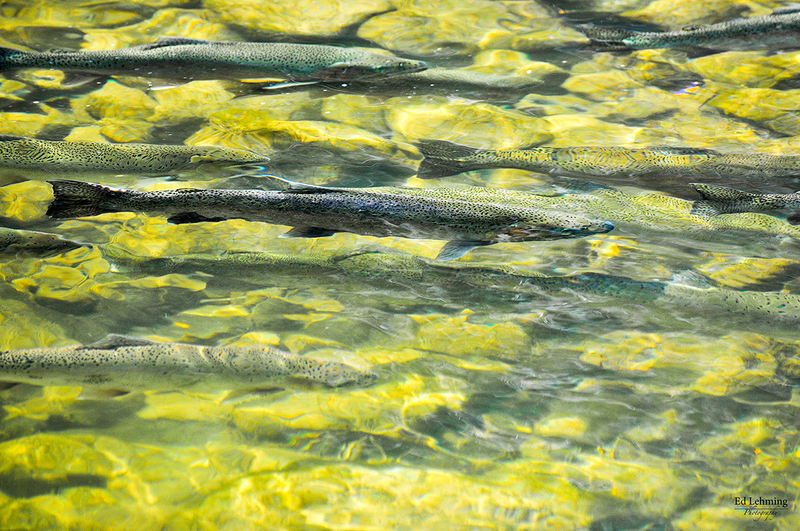 On the spring theme of the Rainbow Trout spawn that occurs every year in this area, here’s a slightly abstract image of a trout mid-run up Duffins Creek, near Whitevale, Ontario. The image above is a time exposure of a single trout swimming against a particularly strong current at a point where the clear water in the foreground is mixing with water contaminated with clay, caused by the spring melt run-off from an adjacent bluff. The dark and barely discernible shadow of the trout hangs suspended above the rocks as the water flows rapidly around him. He appears, for the moment, to be running against the odds. The reality of the image is that the fish is actually ‘stuck’ as the world around him rushes by; neither progressing nor loosing ground. He’s in a transition between clear and murky, movement and stasis. In the end, he broke though and continued his journey up-stream, though that outcome seems uncertain at this moment in time. This entry was posted in Photography and tagged abstract, blurr, clear, creek, fish, motion, murky, ontario, Pickering, shadow, spawn, stasis, struggle, suspend, Trout, uncertain, Water, Whitevale on April 29, 2015 by Ed Lehming Photography. Taken last spring, during a walk along Duffins Creek. Another view of the annual trout run near Whitevale. In places, the trout are ‘stacked’ as they prepare to run up some of the shallower portions of the creek. Last year the creek was especially shallow for the time of year and there were a few deeper pools where multiple fish lined up for their run. I like this particular shot because it has a slightly abstract look to it. Though you can see the shapes of the fish in the water, you can’t make them out very clearly. The slightly greenish tone to the water also gives it a bit of an alien look. The larger fish, near the centre captures the eye first and then you realize that he has companions on his trek. This entry was posted in Photography and tagged abstract, creek, fish, ontario, spawn, spring, Trout, Water, Whitvale on April 28, 2015 by Ed Lehming Photography. Among my favourite photos from last year. Have you ever driven past a place dozens of times and thought, “I should stop sometime and make a photo of this”? That was the case with these poplars in Pickering. They are at the corner of side roads that I pass several time a year. But, the light is never quite right, or it’s dull and uninteresting looking. On this particular day, I had my camera with me, but had no intention of doing any nature photography. It was a dull, rainy day and the landscape was pretty washed out. As I approached the trees, the sun broke through and the poplars lit up a bright yellow. I thought, “I should stop today and make photo of these today”. As I was having this internal conversation, the light began to shift again and a light rain started falling. So, I swung the car around and parked on the shoulder, got my gear ready and proceeded into the adjacent field to see what the light offered. It was not till I got home and looked at the images that I realized just how stunning they turned out. I am so happy that I made the decision to stop (with some prodding from my wife). My advice, when the opportunity presents itself, take it, it may not present itself again. To this day, I have not seen the conditions even close to that day, driving the back roads of Pickering. 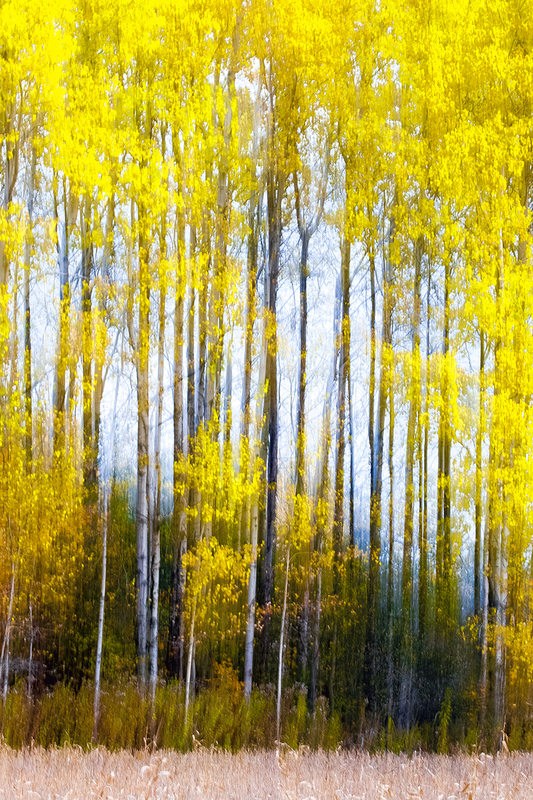 This entry was posted in Photography and tagged abstract, back roads, light, ontario, opportunity, pan, Pickering, poplar, trees, verticle, yellow on April 27, 2015 by Ed Lehming Photography. I love watching the early plants emerge from the dead-looking ground in the spring. They follow the same pattern, year after year, whether it’s an early or late spring, the pattern remains consistent, though sometime s compressed or accelerated. This past winter was particularly cold and spring has been delayed by many cold spells. So, I walk through the woods in hopes of seeing those early emergences. I was very pleased to see the abundance of wild leeks, or “ramps” as they are also known, depending on the region you live in. Though the forest floor is still grey/brown and lifeless looking, these beautiful bright green leaves with the red bases light the forest floor up, while other plants remain dormant. But, the pattern must be followed and nature’s rhythms obeyed. I know, that within the next few weeks the forest will be alive once more with trout lilies, red and white trilliums, and all the other print flowering plants I have come to enjoy so much. I will have to go back in a few weeks and harvest some of these delicious wild leeks for a spring time soup. Can’t wait for the morels and fiddle heads to follow. 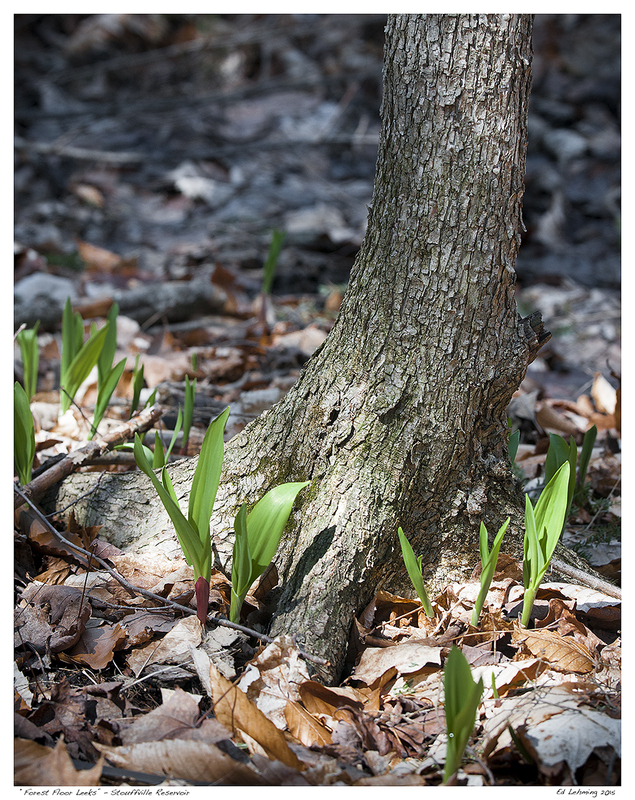 This entry was posted in Photography and tagged emerge, forest, hike, leek, ontario, pattern, plants, ramp, spring, Stouffville, wild on April 26, 2015 by Ed Lehming Photography. I had the opportunity today, now that it is starting to at least look more like spring, to go for a hike around our local reservoir. It’s a beautiful little sanctuary, with diverse plants and wildlife. The hiking trail offers me a nice place to unwind, and photograph, even during a busy day, because it is so close. I was not expecting to see much growth yet, due to the cold and wet spring we have had, but was surprised to see plenty of wild leeks already in leaf. My expectations for finding any blooming plants was very low. But, to my surprise, there were several clusters of these beautiful and delicate pink/purple flowers known as “Spring Beauties” blooming at the base of several beech trees, which seems to be their preference. The other pleasant surprise was that the trout lilies are in leaf and the trilliums are starting to bud out. So, if the weather holds, we should have a nice display in a week or so. Looking forward to it. This entry was posted in Photography and tagged beauty, beech, blossoms, flower, hike, Nature, ontario, pink, purple, spring, Stouffville, wildflower on April 25, 2015 by Ed Lehming Photography. During my drive back from Bancroft this past Thursday, I commented to my wife that it looked like and felt like February, rather than April. Spring has been slow to arrive in southern Ontario this year and my thoughts wandered back to November, when I stopped at Burleigh Falls to make a few long exposure photos of the falls there. At this particular time of year I basically have the place to myself. No tourists taking snapshots, no fishermen trying their best to land the big one, and no kids running madly around the rocks. Long exposure is an apt term for this. It was very cold and blustery and though I love this location, it was experiencing long exposure myself. However, the light was buried and beautiful and made it possible for the image above to be made. I particularly like the colours of the water in contrast with the pink granite in the background and the purplish sky. For me, it captures this moment beautifully, without the bone biting chill. 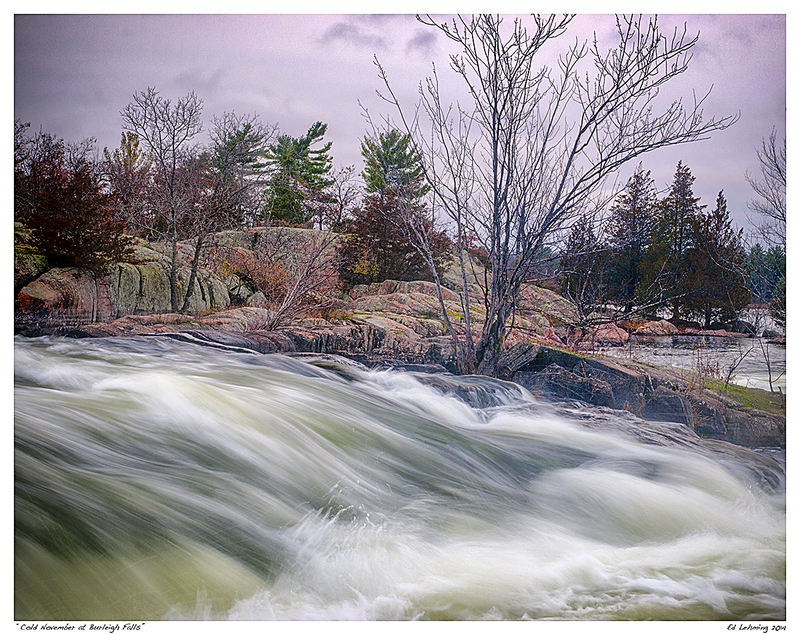 This entry was posted in Photography and tagged Burleigh Falls, chill, cold, colours, drive, falls, fish, granite, kids, long exposure, Nature, November, ontario, Rapids, rocks, tourist, Water on April 25, 2015 by Ed Lehming Photography.